Who Needs Pitching and Defense, Anyway? In his 1975 State of the Union Address, Gerald Ford declared, "I must say to you that the state of the Union is not good." It is in that same spirit of intellectual honesty that I declare to you that the Houston Astros are not an attractive commodity for the 2008 season, to say the least. But there is hope, there is always hope -- not just blind hope, but hope that is well within the realm of the possible. Spring is the time for hope, right? And if that ideal holds true, the Astros have as good a chance as any of the other major league franchises to succeed. Last season was Towles' debut after a few years in the minors. He came up to the big leagues and raked to the tune of a .375 batting average. After last season's disaster, the Astros decided that enough was enough and it was time for a change at the catcher position. They asked Brad Ausmus to return as a backup catcher and mentor Towles, and now he will do that and more. Let's just hope he doesn't teach Towles how to hit! All kidding aside, however, Ausmus is a brilliant catcher, and I am sad to see him go the way of the grizzled, mediocre batsman with a Gold Glove. He is the sort of fellow who I wish I could watch play all day and night, with Adam Everett, in an independent league somewhere. He simply wasn't able to hit major league pitching anymore, and now it is time to step aside for Towles. What will Towles provide to the Astros? A better bat, for one, but lesser defense, although that will be understandable as Houston hopes to out-slug its competitors this coming season because its staff is a joke. All that said, don't count on Towles to continue his hot streak from September into this season, but expect him to be decent and have a quality rookie campaign. His defensive work should be adequate with mentorship from Ausmus and without the pressure of, you know, catching good pitchers. Berkman was terrible in the first half last season, but had an excellent second half of the year and closed the season well. 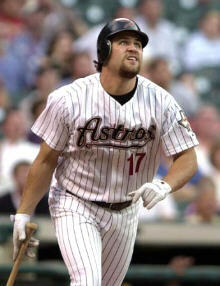 Lance Berkman is one of the better first baseman in the league and he can be expected to contribute as such. I expect him to finish between his 2006 and 2007 totals, although his production might rise from the additions to the Astro lineup this season. Berkman is not a problem for the Astros; that much is certain, unless he winds up with an injury. Now that Craig Biggio has completed his death march for 3000 hits, he has been replaced by...Kazuo Matsui. In a ridiculous move aimed at replacing the face of the franchise with a productive bat, Astros management signed a man who can neither play well outside of Japan nor Coors Field. To be fair, nobody expects him to replace Biggio as a representation, but those who expect him to produce like he did in Colorado should only look at his road numbers as well as his Mets numbers to know that it is unlikely .That isn't to take a terrible amount away from Matsui (there isn't that much to take) because he should be better than Craig Biggio's pale impersonation, but not by much, and certainly not enough to justify his contract. Ty Wiggington is nothing too special but he will hit some doubles for you, especially at Minute Maid, and provide decent defense. Besides Matsui, he might be the weakest link in the Astros� lineup, but he isn't too bad and should provide decent production at the hot corner. As I've alluded to, I'm going to miss Adam Everett, but Miguel Tejada provides replacement level entertainment, if nothing else, with his steroid baggage and playful demeanor. All kidding aside, Tejada is a much better hitter than Everett and the Astros should score more runs with him, and it is likely that he will enjoy the porch in left field. But he will be a major headache for the Astros and a defensive liability. Which I guess doesn't matter when you're trying to outslug the competition. I'm not sure what to make of Bourn, except that he is the type of outfielder I generally am not fond of: powerless. If the Astros feel that his glove is good and his stolen bases and "speed intangibles" will make him worth it, then they should by all means start him. But he seems a little out of sync with the rest of the outfield, which features Carlos Lee, .300-hitting masher supreme (with toast, eggs, bacon, and whatever you ordered for breakfast), and Hunter Pence, the might've-been Rookie of the Year who injured himself and was thus eliminated from the running. This outfield should be plenty productive, but defensively it might leave something to be desired. And by might, I mean it will. The Astros essentially exchange one inept group for another here, although it�s generally a good sign when last year�s starters become this season�s reserves. It excites me to watch Darin Erstad play baseball. On defense. He's graceful and gets to the ball almost every time, and you can see why he's earned the defensive reputation he has, as well as two gold gloves at different positions. But he is another guy who should be playing outside of the major league, as his fragility and offensive mediocrity make him impossible. And you know what? He might be the most exciting player on the Astros bench. Roy Oswalt is one of my favorite five pitchers in the major leagues right now. Depending on the day, he is my favorite in the majors. He's earned it: he's a man who simply loves the game of baseball and excels at it. There's little reason to believe that he won't continue his excellence in the coming season; some are concerned by his declining strikeout rate, but he is one of the few pitchers in baseball who can say, "I'm trying to conserve pitches; let them put it in play." I believe him, because he's been doing it for awhile now and performed well. Besides, anyone who watches Oswalt can tell you that it is not his stuff that has declined. Who rounds out the rotation behind him? That is the question! If Woody Williams, Brandon Backe, Shawn Chacon, and Oscar Villarreal get your motor running, I hope you're on your way home to Mars. Kevin Towers was asked recently how one builds a good bullpen. He might've answered, "Build a homerun proof ballpark" and have been telling the truth, but what he really did say was, "Get pitchers who throw strikes; the rest will take care of itself." Was he right? Maybe. The Astros should try it, and hire several pitchers who throw strikes and see what happens. As it stands, they have no one of note in their pen, and unless they are quite lucky -- which is possible, as bullpens are fickle little things -- this should be a lousy part of the team. Not good. They'll score some runs, but give them up by the barrel. Still, they might become lucky and, in a weak division, come through like the 2000 Chicago White Sox, for instance: by slugging their way to the postseason. Likely? Not really, but we've put a man on the moon before, right? An 83-win baseball team won the World Series in 2006. Richard Simmons continues to find work. Spring is the time for optimists, and Houston might be a lot of fun to watch for at least nine half innings per game, and several full ones when Oswalt pitches. Dare to dream!